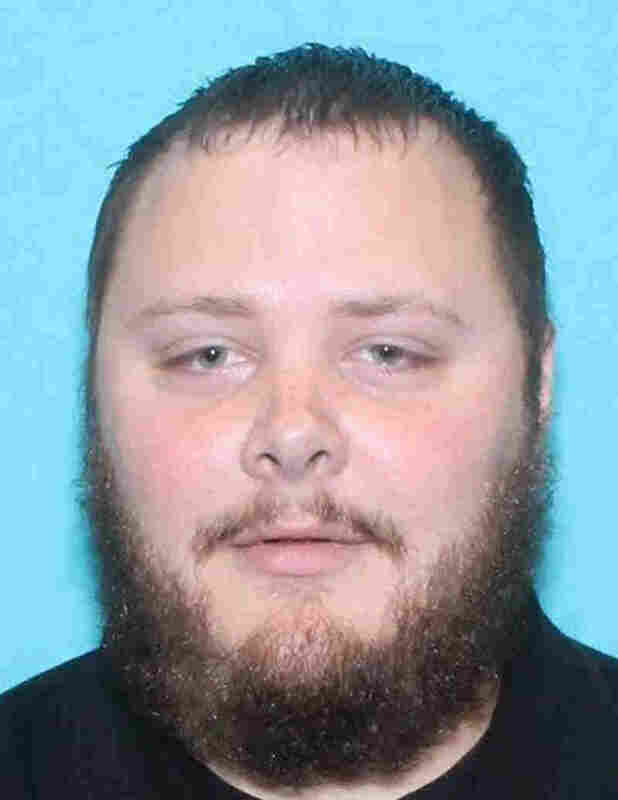 Texas Church Shooter May Have Been Motivated To Kill By 'Domestic Situation' : The Two-Way Authorities said they don't believe racial or religious reasons drove Devin Patrick Kelley, who killed 26 people in Sutherland Springs. Here's what we know Monday — and the questions still unanswered. 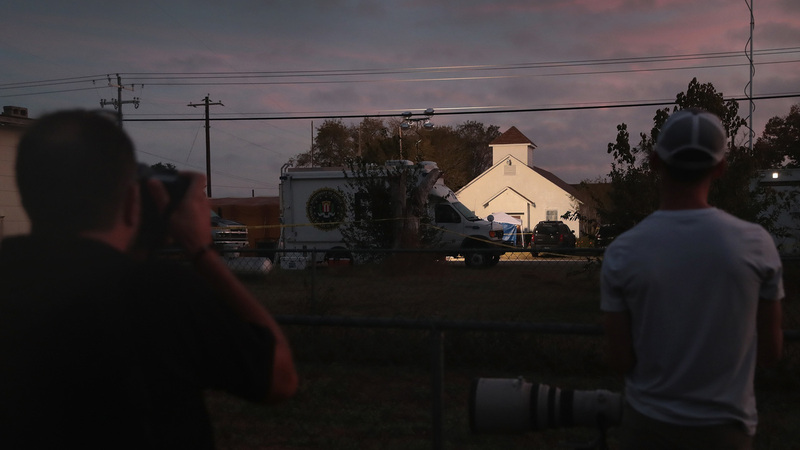 Newspaper photographers look on as the sun rises over the First Baptist Church in Sutherland Springs, Texas, the site of a mass shooting during a Sunday service. 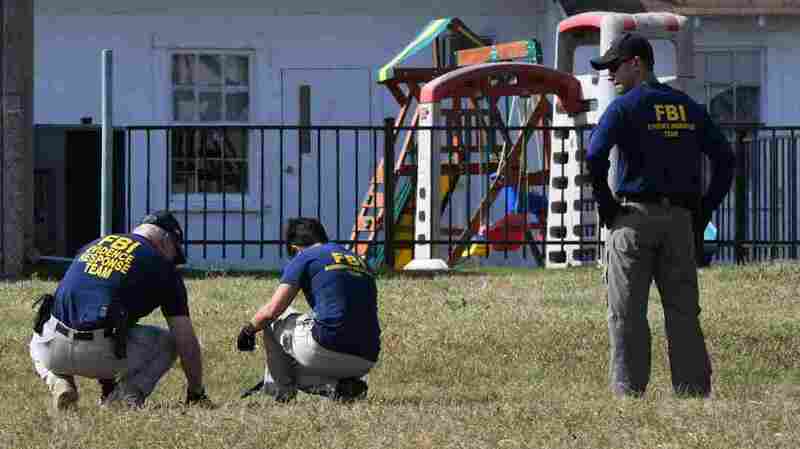 A "domestic situation" might lie behind the massacre that unfolded at a small South Texas church during Sunday services, authorities say. At a news conference Monday, law enforcement officials explained that the gunman — identified by police as 26-year-old Devin Patrick Kelley — had sent threatening text messages to his mother-in-law, who is has attended the First Baptist Church in Sutherland Springs, Texas. Currently, officials say they do not believe the attack was racially or religiously motivated. "One thing everybody wants to know is, 'Why did this happen?' It's a senseless crime," said Freeman Martin of the Texas Department of Public Safety. "But we can tell you it was a domestic situation going on within this family." Those aren't the only details to come to light about the shooting, which left at least 26 people dead and many others injured. More than 24 hours removed from the killing, a devastating portrait of events is emerging, while many questions remain unanswered. Here is what we know about the church shooting in South Texas — as well as a few of the details we're still seeking. At about 11:20 a.m. local time, a suspicious man was reported near a convenience store across the street from the church. Dressed in black tactical gear, wearing a mask and toting an assault-style rifle, the man walked toward the church as a prayer service was underway. The gunman opened fire even before he entered the building, unloading bullets into the walls from outside. Then, he stepped into the church and continued his attack, killing 23 worshippers inside. Two people were killed outside the church, and another person died on the way to the hospital. Officials say that not long afterward, Kelley left the building and headed toward his car — at which point a local resident, having seen the attack, drew a weapon and confronted Kelley. "We're calling him our hero," Wilson County Sheriff Joe Tackitt told Texas Public Radio's Joey Palacios on Monday morning. Tackitt said that local resident fired on Kelley and then, after Kelley dropped his rifle and started to flee in his vehicle, the resident "stopped a young man who was [in a car] at a stop sign and said, 'Let me in — follow that vehicle.' "
"He opened my door and proceeded to get in and say, 'That man — that guy just shot up the church. We've got to go follow him!' " the motorist, Johnnie Langendorff, told Palacios. "And I said, 'OK.' "
Langendorff said he and the local resident — who has not been officially identified — pursued Kelley at speeds of up to 95 mph. During the high-speed pursuit, Kelley called his father, telling him that he "didn't think he was going to make it," according to law enforcement. Eventually, Kelley "slowed down a bit, losing control," Langendorff said. "I think he tried to re-pick up speed, lost it again and ended up in the bar ditch." "We parked across the street. We got behind my truck for safety," he continued. The local resident "drew his rifle on [Kelley] and told him to 'get out, get out' but he did not get out." When police showed up shortly thereafter, they found Kelley dead beside two more weapons in his car. Authorities believe he shot himself, although the medical examiner also found two other bullets in his leg and torso from his civilian pursuer. FBI agents search for clues Monday beside a playground near the First Baptist Church in Sutherland Springs, Texas. Devin Patrick Kelley lived in New Braunfels, a suburb of San Antonio, according to authorities, and he had for some time. The 26-year-old gunman had also attended New Braunfels High School. After his time in school, Kelley served a tumultuous stint in the U.S. Air Force, enlisting in 2010 and receiving a bad conduct discharge from service in 2014. During that period, an Air Force spokeswoman tells NPR that Kelley was court-martialed for assaulting his spouse and child. He "fractured his baby stepson's skull and then he also assaulted his wife," retired Col. Don Christensen, the top prosecutor at the time of Kelley's court-martial, told NPR's Camila Domonoske. Kelley accepted a deal, pleading to "intentionally inflicting grievous bodily harm" on the child and assaulting his wife. He was sentenced to one year's confinement — reduced from the five-year sentence a conviction could have carried. Kelley unsuccessfully appealed his discharge in late 2013. The situation leads investigators to at least one crucial question: How did Kelley obtain his weapons? According to federal agents with the Bureau of Alcohol, Tobacco, Firearms and Explosives, Kelley purchased four weapons over the span of four years, at a rate of one gun a year — but officials say Kelley did not have a license to carry them. Because his assault conviction was for an act of domestic violence — and because he was convicted of a crime that carried a maximum penalty of more than one year — Kelley was banned from possessing firearms under federal law. It is "a federal offense for anyone convicted of a misdemeanor crime of domestic violence to ship, transport, possess, or receive firearms or ammunition," according to a publication by the Air Force Judge Advocate General's Corps. Crucial questions also continue to linger about Kelley's relationship with his in-laws, who "showed up later in the afternoon" Sunday, Tackitt told Palacios. "That's how we found out that they had attended the church." 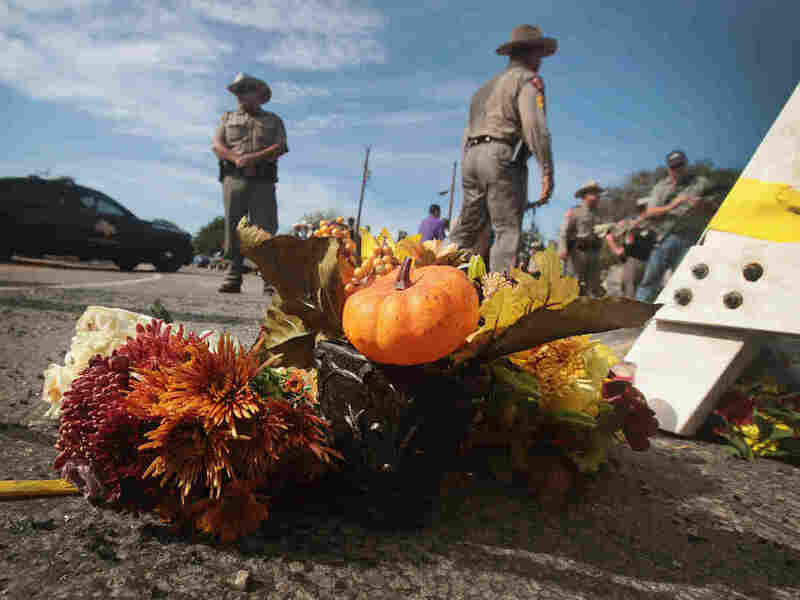 Flowers rest beside a police barricade near the First Baptist Church of Sutherland Springs, Texas. Authorities say the victims' ages range from just 18 months to 77 years old. Authorities have not named the victims of the shooting, noting that they are waiting until they can first notify families personally. They said the victims inside the church range in age from just 18 months to 77 years old. "It was just horrific," Tackitt said of the scene in the church after the shooting. "I mean, words can't express what was there. It's hard enough to see an adult. But when you see babies, little ones. I'm talking 3, 4, 5, 6 years old, 10 years old. It's just hard." Leslie Ward, who lives just two blocks from the church, told NPR's John Burnett that her 8-year-old niece was killed, while her brother-in-law's wife and 5-year-old twins were hospitalized. "The scene looked terrible," she said. "Everybody was bleeding, crying. There was dead bodies everywhere. Babies. People trying to just get ahold of their family — but of course their phones broke. They shattered. And people just crying. Just really, really bad off — disaster, blood everywhere." In such a small town as Sutherland Springs — a rural community with fewer than 1,000 people and just a few roads — one theme continues to arise among witnesses and residents: In such a tight community, the devastation is likely to touch the lives of everyone nearby. "Everyone I spoke to at the vigil [for victims Sunday night] knew someone in that church," David Martin Davies, a reporter with Texas Public Radio, told Morning Edition on Monday. "And not only are they mourning the loss, but they're also very worried about people that are still in surgery trying to recover — because many people have multiple gunshot wounds, and they don't know what the future holds for them."